Diamond grinding (Figure 1) refers to a process where gang-mounted diamond saw blades (Figures 2 and 3) are used to shave off a thin, 1.5 – 19 mm (0.06 – 0.75 inch) top layer of an existing PCC surface in order to restore smoothness and friction characteristics. Most often, it is used to restore roadway friction or remove roughness caused by faulting, studded tire wear, and slab warping and curling. 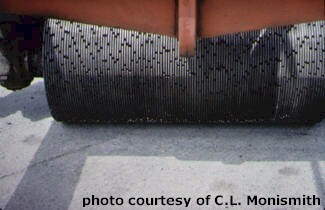 Diamond grinding can reduce the IRI of an older pavement to 1.0 – 2.0 m/km (63 – 126 inches/mile). Figure 1. Diamond Grinding Machine. Figure 2. 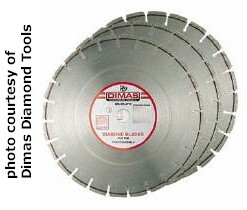 Diamond Saw Blades. Figure 3. Gang-Mounted Diamond Saw Blades. Corrective maintenance. 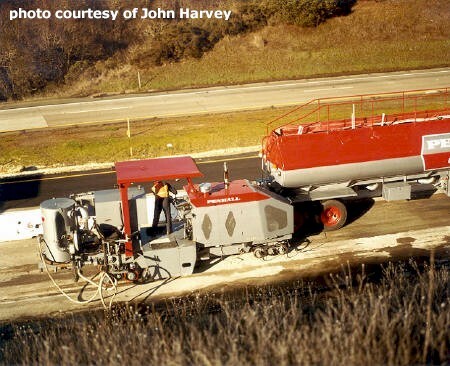 Restores pavement smoothness and frictional characteristics. Can also be used in new construction to attain initial specified smoothness, although properly constructed PCC pavements should not require any diamond grinding.